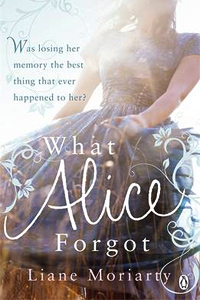 What Alice Forgot is a gripping novel about a woman who after an accident forgets the last ten years of her life. Ten years in which she changes as a person, her marriage deteriorates, friends leave and others come into her life. And needless to say she's in for somewhat of a shock when she eventually realises that she isn't in fact pregnant with her first baby, like she believes she is, but already has three school-bound children. Author Liane Moriarty realistically depicts the confusing time Alice goes through when she slowly unravels the missing ten years of her life and tries to come to terms with the fact that she is no longer a free-spirited 29 year-old young adult with her whole life ahead of herself, but a nearly 40 year-old mother with all the worries and responsibilities that come with that. It's a fascinating journey for the reader and a difficult one for Alice, as it hasn't been always rainbows and butterflies and she's forced to face choices she made while she was in a different mindset than her 29 year-old self. While she may be able to change some choices she's made in her life, others have led her on a path with no return. This realisation is not always easy for the reader either and while I personally wasn't happy with the conclusion (particularly Olivia's story) I do understand that for the story to remain realistic there was no possibility for a perfect happily ever after ending.